Recently, I noticed that my most frequently carried pistol is an old Glock 23 in a pancake holster, a type that I don’t normally favor. I am not a great fan of mid-size .40 pistols, so this practice puzzled me. On some thought, I realized that the pistol fits my hand just too well to be left at home. It’s my only truly custom handgun, fitted to my hand by my friend Brandon. And the holster was made by my friend Dennis of Dragon Leatherworks. It’s just too comfortable not to wear. Last weekend, I saw several new designs from Dennis, took photos and will be posting them as I get them ready for web. Below is a very comfy PPK holster. The whole point of going to a custom designer is the ability to specify exactly what you want. 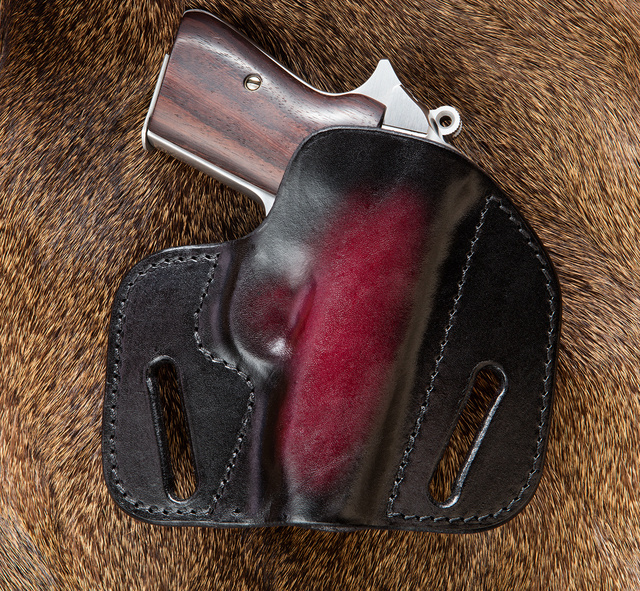 He made a Star SI .32 holster for me once — where could I have found a production holster for that? Or something for a Webley Mk.2, or a rig for a mainstream XDM but in ostrich skin for the unique look and feel? Take a look at his site. The holsters stand up to heavy daily use and yet make the weight of the gun pretty much disappear. This entry was posted in holster and tagged leather. Bookmark the permalink. My biggest gripe with the 40 S&W is the recoil impulse. It is too “snappy” for want of a better description. The 9mm is a different and more pleasant animal.